An another blog, new challenges! I was looking at the Event Viewer of the machine that had the “issue”, but there was nothing to see in the logs on the windows machine. My first reaction was what the **** is wrong here. When I started a tail of the desktone log on the tenant appliance for this tenant I saw some errors. 2019-01-09 11:46:42,380 ERROR [org.hibernate.engine.jdbc.spi.SqlExceptionHelper]-[https-openssl-apr-8443-exec-10] Batch entry 0 update T_GENERAL_MACHINE set IP_ADDRESS=’fe80::995c:1a86:8be0:17f7′, FULL_OS_NAME=’Microsoft Windows Server 2016 (64-bit)’, TOOLS_STATE=’ok’, DATE_UPDATED=’2019-01-09 11:46:42.368000 +00:00:00′ where ID=’35b4d745-4828-45e0-ac9f-17342c962135′ was aborted. Call getNextException to see the cause. Especially the message “ERROR: value too long for type character varying(16)” is interesting. It turns out that DaaS tries to update the database with an IPv6 address but this table is not suitable for this. 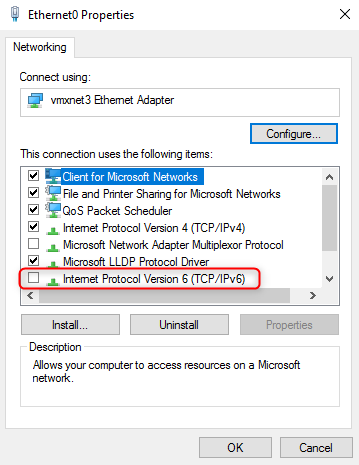 My solution is to disable IPv6 on the network adapter in my image and recreate the assignment. It turns out that IPv6 reacts before IPv4 does in some scenarios, and because of that, Horizon DaaS uses the IPv6 to create the VM in the Horizon DaaS DB table. The result is that IPv6 is disabled on your network adapters.